When you make a blog with either WordPress or blogger. The first thing you want is traffic. You might be very good in publicizing your blog on various social media's but to really increase website traffic you need organic traffic. The organic traffic is the traffic, coming directly from search engines like Google, Bing, Yahoo, Ask, etc. So, to get organic traffic you have to do website promotion. You have to submit website to Bing or you have to submit website to Yahoo. So, they can index your site in search results. When it comes to getting organic traffic and search engine optimization of website. We should make sure that we optimize our site fully. We should not rely on only one search engine for getting traffic. We need to submit url to all the top search engines to get more traffic on website. Yahoo search engine submission or bing search engine submission is not enough. As you all know Google is the most popular search engine as compared to other search engines. So I'll suggest you before you submit WordPress site to Bing and yahoo, submit site and sitemap of your blog or website to Google as well. Below mentioned two post will help you to do so. For now I will keep this article simple and up to the point and we will see how to get your site indexed in bing search and yahoo search. Submitting site to bing means actually submitting site to bing webmaster tools. For those who heard this term first time, Bing webmaster tools is a free seo tool or service offered by microsoft for publishers for adding websites. So, we submit our site to bing for indexing and not only this we can see how much clicks, impressions we have. We can catch crawl, page not found, etc type of errors and maintain our site's health. More over it will help bing bots to crawl your website and indexed it in bing search. Note :- You do not have to do yahoo submission separately. When you submit site to bing. Automatically, you submit site to yahoo. The bing search engine do this job for you. Isn't it cool ? Step 1 :- You should have Microsoft Account to submit blog to Bing. If you have microsoft account then simply login to Bing Webmaster Tools. If you do not have microsoft account simply create it for free. Step 2 :- Add URL of your blog and Click on ADD (submit url to bing). 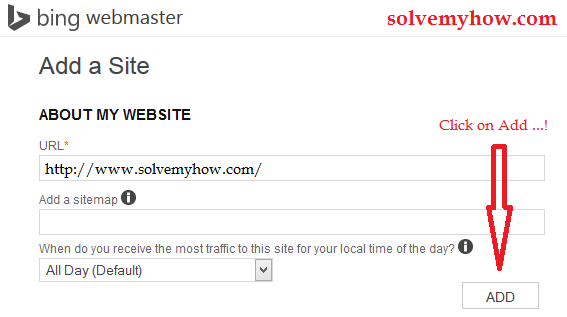 Step 3 :- Add a sitemap to bing. Well, you can skip this step for now. But in case if you want to add then create sitemap first and then submit it. Below mentioned post will help you to generate sitemaps for WordPress Blog. Step 4 :- Click on Add button. Step 5 :- Now, you have to verify your blog ownership with Microsoft Bing. You will be now redirected to bing webmaster tools dashboard, where you will see one message "Site ownership has not been verified. Verify now". Click on "Verify now" button and select any of the 3 methods to verify your site. Add CNAME record to DNS (Read :- How to Setup Custom Domain in Blogger). I will suggest you to go with option 2. Copy the Meta tag (bing verification code), as its pretty easy to add meta tag. Now, if you are using Thesis WordPress theme. Then, simply go to Thesis site Options >> under Additional Scripts. Paste the meta tag. Go back to verify ownership page and click on Verify button to verify your site with bing webmaster tools. If you are using WordPress SEO by yoast. Then just copy the "Content" part from meta tag verification code and paste it into WordPress SEO dashboard settings. Again go back to bing webmaster tools and click on verify button. That's it. Congratulation, you just have submitted your WordPress site to bing (Yahoo as well). 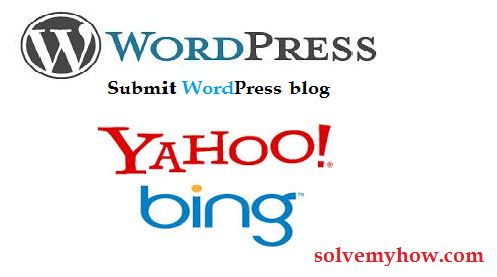 Now, go ahead submit WordPress sitemap to yahoo and bing and enjoy free traffic from these search engines. I have tried my best to explain this article in simple steps. Hope you found this post helpful. Do share it with your social media friends. So, they can submit their WordPress site to bing and yahoo. Don't forget to join SolveMyHow on Facebook and also subscribe for SolveMyHow newsletter to get WordPress and Blogging tips right into your INBOX ! Thanks for stopping by. I wish you a good luck for your new blog.